It was a typical morning. The beds were made, boys were dressed, I got myself ready and headed to the kitchen to join the family for breakfast. That’s when it all changed. One simple, seemingly harmless observation was all it took. “Hey! You’re wearing a blue shirt and so is Daddy – did you guys plan that?” I asked Son #3 who was busy eating his cereal. “I’m wearing blue, Daddy is wearing blue and so are you!” and he pointed to Son #4. “I have blue on my shirt, see? !” piped up Son #1, clamouring to be included in this momentous occasion. “But it’s not ALL blue, like Daddy and me,” retorted #3. “It’s blue. Right. Here,” #1 shot back. “And me,” #1 angry-whispered, not willing to back down. 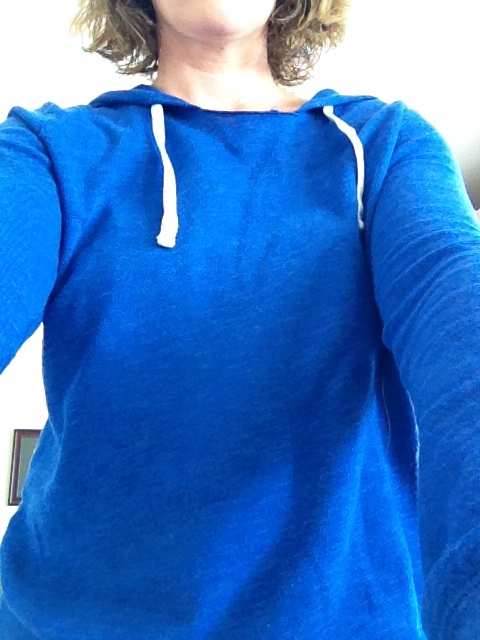 Me: “I’m wearing a blue shirt today, too, but it’s not the same shade.” (What? Why was I still engaging in this conversation? Somebody stop me). Are you even hearing me? Maybe they can’t see me. Wait, Bearded Husband just rolled his eyes at me, so I’m definitely visible. #2 Son strolls into the kitchen. #2 shrugs and exits kitchen. #4 randomly shouts out, “NooooooOOOO,” just to be controversial, then struts out of the room. I’ve lost track, what were we debating? Is it hot day? Did I put pants on? I’m so confused. Once you’ve had kids for a while you can tell the difference between their cries of distress and yelps of pure joy. However, there are some things that no parent wants to hear coming from the basement while the children play. A good mom would intervene or at the very least investigate in that situation. That was your own fault. Well, I didn’t give him the marker. My turn with the handcuffs. A responsible mom would hear those raised voices and rush to check on the little darlings. Then there’s Option B: Carry on and hope for the best. After all, they will definitely come upstairs to find you if there is any blood. What’s the most frightening thing you’ve heard your little cherubs say. And yes, sometimes silence is the scariest thing of all.